St. Thomas, the small college north of New York City where Professor Alison Bergeron teaches, has had its share of scandals—on and off campus; among both students and staff; and, lo and behold, with Alison herself. So when one of St. Thomas’s resident directors goes mysteriously, scandalously missing, the administration wants to keep a lid on it. With only five weeks left in the semester and no time to interview replacements, Alison is tapped for the job. An alumna of the college, Alison knows all about living in the dorms. Even a short stay is like doing hard time. Her only way out: To take it upon herself to track down the RD and get back to the business of being a real adult—and have real sleepovers with her adult boyfriend, NYPD Detective Bobby Crawford. 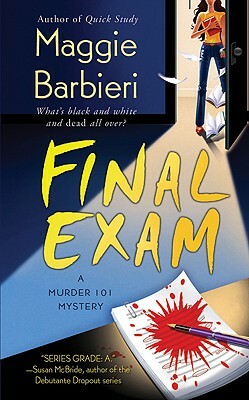 But, as she and Bobby are about to discover, the plot of this case is more complicated than, say, a Shakespeare play…and when it comes to solving crimes on campus, there’s only pass or fail.